Urban noise is a serious problem. Past studies have found that traffic noise is correlated with sleeplessness, stress, learning impairments among children, and heart attacks. But there are pleasant sounds in cities, too, and their presence positively affects the health of urban dwellers, a group of researchers say. Urban planners should think not just about minimizing noise, but more broadly about how the presence of different sounds, both pleasant and annoying, shapes people’s lives in a city, the researchers -- Daniel Quercia of Bell Labs, Rossano Schifanella of Turin University, Luca Maria Aiello of Yahoo Labs and Francesco Aletta of the University of Sheffield -- argue in a new paper . Then they searched for these sound terms in social media, specifically by combing through millions of geotagged Flickr photos, so they could map up the sound tag with a specific city street. 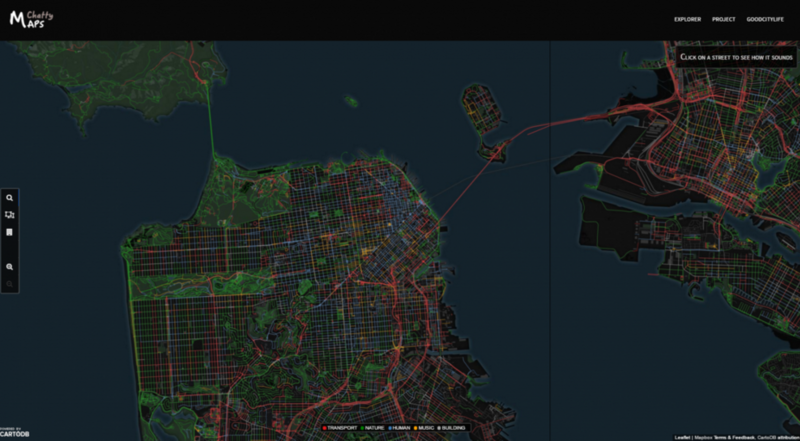 Finally, they used that data to create interactive maps of 12 cities around the world .